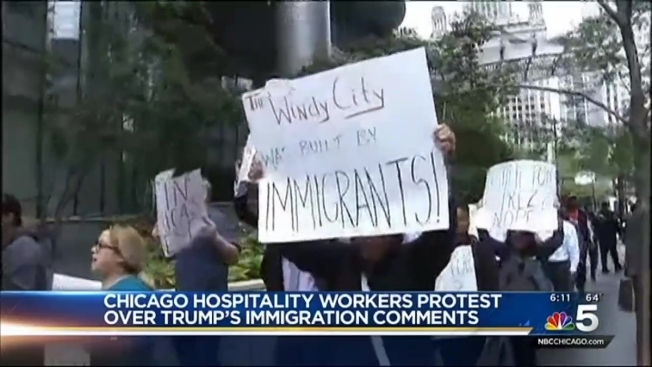 A local union of hospitality workers marched in front of Trump Hotel on Wednesday to protest GOP presidential candidate Donald Trump's recent remarks on immigration. The UNITE HERE Local 1 group, which includes members in the gaming, hotels and food service industries, organized the protest in response to Trump's comments about Mexican immigrants in his presidential run kick-off speech. In the speech, Trump said Mexican immigrants are "bringing drugs, they're bringing crime, they're rapists." "No one who makes demeaning, ignorant comments about immigrants deserves to be president," Karen Kent, president of UNITE HERE Local 1, said in a statement. "It's clear Trump doesn't know how to be hospitable. Immigrants are welcome in Chicago. Trump's views are not." Leaders of UNITE HERE Local 1 said many of their members are Mexican immigrants. A group of 30 to 40 people gathered Wednesday morning in front of Trump Hotel at 401 N. Wabash to "communicate their disgust with presidential wannabe Trump's attack on immigrants."